This year’s TFWA World Exhibition will see Illva Saronno reveal the latest in its line of annual Limited Edition designer bottles of Disaronno® (Bay Village, Bay 19). For the new end of the year holiday season 2018, Disaronno® introduces ‘Disaronno Wears Trussardi’ — an exciting Limited Edition where, true to form, it chooses an Italian lifestyle brand to make its unmistakably unique bottle extra special. Sense of tradition, innovation and Italian elegance are some of the values the two brands share. They are values that emerge clearly in this latest Limited Edition, where the typical Trussardi texture and greyhound logo unite with the Disaronno bottle’s distinctive shape. Fine fuchsia, green and blue brushstrokes frame the famous label for a totally ‘today’ result. “For years the Limited Edition has marked an annual highlight with reference to our brand’s visibility,” comments Illva Saronno Holding CEO Augusto Reina. "Disaronno® is appreciated across the globe as an emblem of Italian style. And this year we are proud to make a particularly classy, elegant statement with a graphic design that reflects in full our perfectly modern essence.” “The Trussardi story is very much about innovation, discovery, the concept of fusion. In addition to strengthening the bond between two companies that epitomize the Italian spirit worldwide, designing the iconic Disaronno bottle underscores once again that Trussardi continues to be a 360° lifestyle brand,” says Tomaso Trussardi, CEO of Trussardi. Along with the classic bottle, the Disaronno Wears Trussardi Limited Edition comes in two delightful sets of mini bottles, in packages of three, they as well collector’s items. Domenico Toni, Illva Saronno’s Global Sales Director, says: “The Limited Edition bottles have been very well received in travel retail since we launched the concept six years ago. 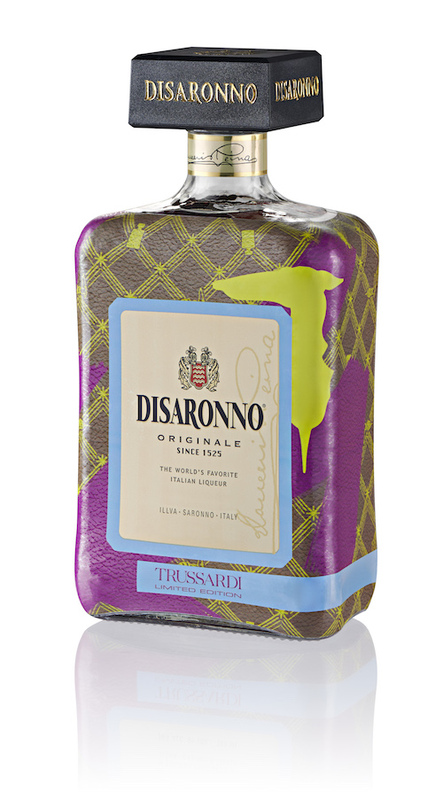 The new Disaronno Wears Trussardi bottle is an ideal holiday gift for fashion aficionados or great for self-purchase to share with friends, making it ideal for GTR. The bottle has masses of shelf appeal, while the miniature bottle sets are ideal for point-of-purchase/till point sales – a perfect opportunity for adding value to the basket..” With its unique flavour and golden amber hue, Disaronno® has a distinctive aroma that has won fans of all ages; taking Italian style to many corners of the globe. Delicious both neat and on the rocks, Disaronno® is perfect for celebration. This year sees a smart hero cocktail: Disaronno® Sparkling, a simple yet delicious drink that consists of 1 part Disaronno® and 3 parts Prosecco (Italian sparkling dry white wine), with a currant sprig garnish. “As usual in Cannes we will be serving our signature cocktails at our stand, including the new Disaronno® Sparkling, and look forward to catching up with existing customers as well as potential new partners, and having a fun and productive week.” #DisaronnoWearsTrussardi is the sixth Limited Edition of the Disaronno® Icon project, the brand’s annual collaboration with a leading name in Italian fashion.